Partypoker is looking to dominate the short deck Hold’em game with a variant it describes as the only true replica of what’s played on the Triton Poker Tour. Having watched from the sidelines as its peers rolled out their versions of Short Deck aka Six Plus Hold’em, Partypoker is now ready to compete. Announcing its latest innovation on March 27, the online operator said “SHORTDECK” will stay true to the format enjoyed by Triton regulars. The poker community at large first learned about short deck Hold’em in late 2017. 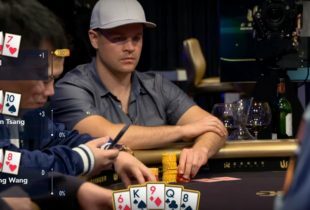 Despite being familiar to high stakes grinders, it wasn’t until Tom Dwan and Phil Ivey championed the game that it hit the mainstream. To create some hype around the Triton Poker Tour where it’s most often played, Dwan provided a quick guide to its rules (see video above). In simple terms, all cards below a six are removed from the deck. With only 36 cards in play, aces can be high or low and complete either end of a 6-7-8-9 straight. The other main difference between traditional Hold’em and short deck is the hand rankings. When it was first played by Triton regulars, standard rankings applied. However, the players soon realized that flushes were harder to come by than full houses. The values were subsequently reversed and, today, a regular flush beats a full house. Staying true to the game played Dwan, Ivey, Paul Phua and others, SHORTDECK will be ante only. Unlike the variants currently available on the Winning Poker Network (WPN) and PokerStars, Partypoker’s games won’t feature small and big blinds. Instead, every player will place a pre-flop ante equal to the one percent of the buy-in. For example, at a $100 six-max table, each player will put in $1 before the cards are dealt. Alongside the traditional ante format, SHORTDECK players can also remove chips from their stack once it reaches a certain size. This feature is designed to mitigate the extra variance short deck Hold’em produces. By mimicking the conditions used by Triton regulars, Partypoker is hoping to win over high stakes players. At this stage, the software is in beta testing mode, but it may well produce another twist in the current Partypoker/PokerStars industry war. Over the last few weeks, lottery-style sit and go tournaments have become the battleground of choice. However, with Partypoker offering heads-up, six-max and full-ring games, it’s rival may feel obliged to respond. Even though its six-max games have been active since January, players often gravitate to the most diverse platform. With that being the case, the launch of SHORTDECK may add another wrinkle to the already entertaining back-and-forth between the top online poker operators.